Just as I am, I come to you. I look to your life, in all I do. Or Source of Love, I come, I come. I surrender all, now cast them out. Oh Source of Faith, I come, I come. The fullness of all you've breathed in me. Oh Source of Life, I come, I come. Check out Oprah's Fight Club! Hilarious! This song always reminds me of The Kinks. One of my FAVE videos of all time! "He who wants to expand the field of happiness, let him lay the foundation of it on the bottom of his heart." It has been truly surreal to move from a primarily liberal environment to an extremely conservative one. I have had a relative compare Obama to Hitler, and he wasn't joking. Another otherwise sweet woman told me that Obama couldn't be president because he was a Kenyan Muslim, and she wasn't joking either. Sheesh. Living God, we thank you that in this sacrament you make yourself known to us. whenever we stumble into unexpected joy, we shall feel your heartbeat there. Whenever we go we start from here and we go in the peace of Christ. Amen. that brings vision and warmth. from full day to night. Don't know how to begin solving your money woes? Speaking of the class, I watched the whole thing and just now took the final exam online. I passed! I now qualify to win $50,000! I promise if I win, I will use the money wisely. "I used to think the worst thing in life was to end up all alone. It's not. The worst thing in life is to end up with people who make you feel alone." Got this link through Fibro TV. Maybe now we can get somewhere in terms of addressing fibro-fog? This makes a lot of sense to me. Because no matter how well-rested and not depressed I am, my brain fog is still disabling. That is, UNLESS my pain level goes down significantly, which unfortunately does not happen often enough or long enough for me to think normally. Party Rock is in the wrong house! I like that there are links for caregivers. They are usually overlooked when it comes to advice. Taking care of a seriously ill person is tremendously isolating. You can do a search specific to certain dietary needs, like gluten free or suitable for diabetics. Each food is assigned an overall score, plus a color - red is the least healthy, yellow is average, and green is the healthiest. If you create a profile, you can put together a customized list of foods for your grocery shopping. You can also look and see if your favorite foods have healthier alternatives and "trade up". "If we all did the things we are really capable of doing, we would literally astound ourselves." Movie Review: "One For the Money"
If you were broke, what would you do to earn $50,000? Would take on a job for which you had no training? Even if that job were potentially dangerous? 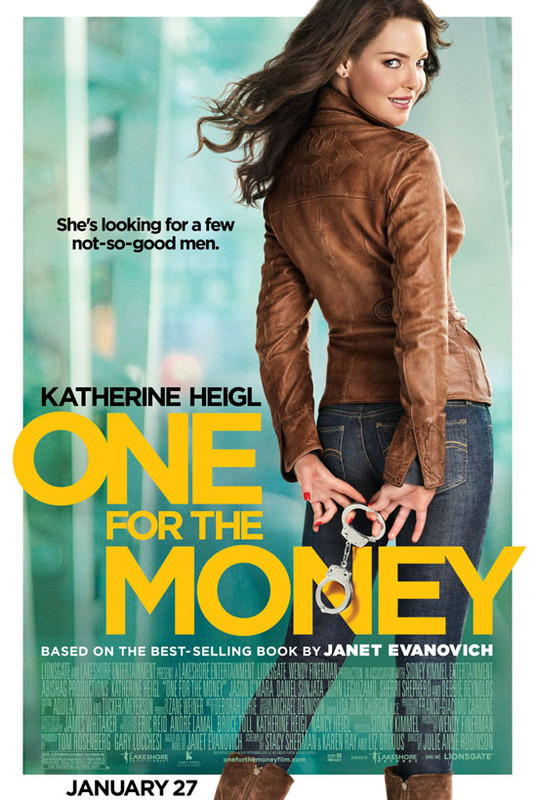 Those are the questions answered by Katherine Heigl in the comedy/mystery "One For the Money", which hit the theatres January 27th. 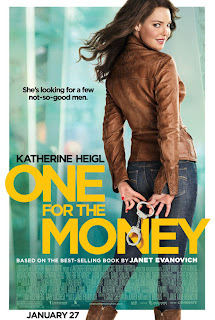 Based on the prolific Stephanie Plum series of novels by Janet Evanovich, Heigl is Plum, broke and desperate after losing her job as a lingerie buyer. She goes to work as a bounty hunter for her bail bondsman cousin. Trouble is, she doesn't know the first thing about how to bring in a bail jumper. But with dollar signs in her eyes and a chance to haul an ex-lover into jail, she conveniently overlooks her complete ineptitude and goes about searching for her target, Joe Morelli, a cop charged with murder. Plum is given some cursory guidance by a pro who goes by the name of Ranger. We learn next to nothing about him except that he's cool under fire, has deadly aim, and may or may not operate outside the law. He buys Stephanie a gun, an action he probably regrets later. One person who is excited about Stephanie's career choice is her grandmother, played by the delightful Debbie Reynolds. The funniest scene in the movie involves Grandma and a weapon at the dinner table. I am hoping they make a film of the second book in the series because Grandma is has a larger role in that one. While tracking down and attempting to bring in Joe Morelli, Stephanie encounters many other colorful and/or shady characters, including a brutal prizefighter, his slimy manager, and a couple of hookers. Lula, one of the hookers, has plenty of curves, an even bigger attitude, and a wig for every occasion. She becomes Stephanie's ally during the investigation and her friend afterward. Plum finds out the hard way that bounty hunting is much more difficult than it appears, especially when your target is clever. Thanks to Mr. Morelli, Stephanie finds herself in situations that are embarrassing, such as being handcuffed to a shower curtain rod, and frightening, such as being shot at. Nothing like learning as you go. I must admit I had a bit of trouble at first adjusting to Heigl as Plum, as she had not been who I envisioned when I read the book. But she eventually did win me over. The rest of the casting was fine with me. Most of the profanity that was in the book was left out of the movie, and the violence was toned down so that there was more implied than shown. I am guessing this was done to gain a wider audience and to better sell the story as a comedy. Some of the time line of the book was compressed, but none of the major plot elements were omitted completely. There are eighteen books in the Stephanie Plum series. I don't know if there will be sequels for this movie, but if there are, "One For the Money" is a pretty good start to the saga.